A beautiful example of Rizzi-Zannoni's c. 1771 decorative map of the Poland and its tributaries. Covers from Denmark and Germany eastward to Russia, northwards to Livonia and south to Hungary. Includes Lithuania, Prussia, Greater Poland, Lesser Poland, and parts of Russia. Germany, Hungary and Bohemia. A baroque style decorative title cartouche depicting the Polish eagle crest appears in the upper right quadrant. Drawn by Rizzi-Zannoni c. 1771 for issue as plate no. 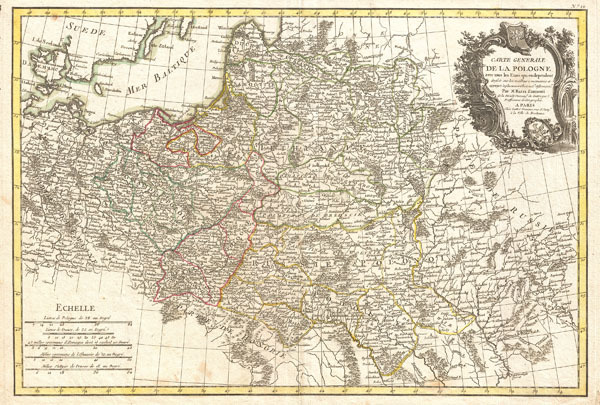 10 in Jean Lattre's 1776 issue of the Atlas Moderne.